The three top teams from last week all wound up in tough fought conference games this past weekend. North Dakota State outpaced Northern Iowa in the fourth quarter to win and South Dakota State blew an eighteen point 4th quarter lead before winning in overtime against Indiana State. James Madison was not as lucky. The Dukes struggled through much of the day and wound up losing to Elon. As we head to the mid point of the FCS season, we are going to start to see the playoff contenders start to weed themselves out week by week. But in a deep FCS landscape, we may not have much of an idea of who will be in and out until we get to Selection Sunday. North Dakota State remained unbeaten, but not without a challenge. Northern Iowa led the game after three quarters, but the Bison scored the last 28 points of the game to remain unbeaten. The Bison were led by Easton Stick’s six total touchdowns. This week, the Bison head outdoors for the first time this season at Western Illinois. Is this their trap game? No Gage Gubrud? No problem. The Eagles were missing their Walter Payton Candidate quarterback against Southern Utah, but it did not matter. Eric Barriere filled in more than admirably, throwing for 233 yards and a touchdown, as well as running for 98 yards and two more touchdowns. This week the Eagles travel to Weber State which may determine who wins the Big Sky. 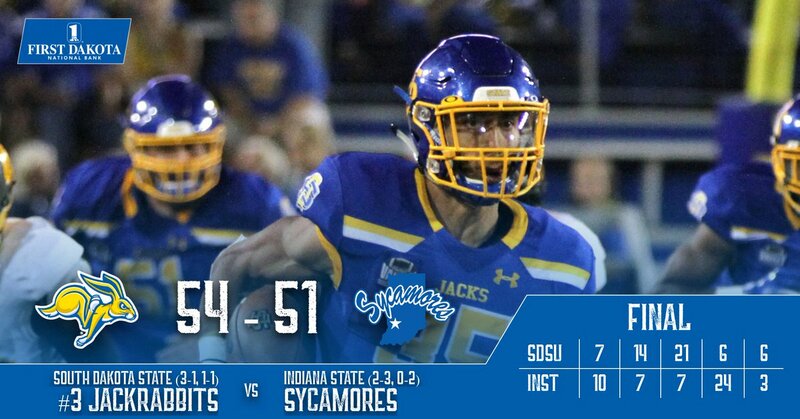 South Dakota State may have experienced a bit of a hangover from their loss to North Dakota State as they took overtime to beat Indiana State. The Jackrabbits gave up 24 points in the fourth quarter before Isaac Wallace ran in the game winning touchdown in overtime. The Jacks will look to get back on track when a struggling Youngstown State comes to town. Kennesaw State continued to run over their lesser opponents in a 56-0 win over Presbyterian. Chandler Burks ran for another four touchdowns in the big win. This week, the Owls should easily handle a Gardner-Webb team who will be facing their third straight ranked opponent. The Owls only real Big South test could be Campbell before they face Jacksonville State on the last Saturday of the season, which could potentially be for a playoff seed. 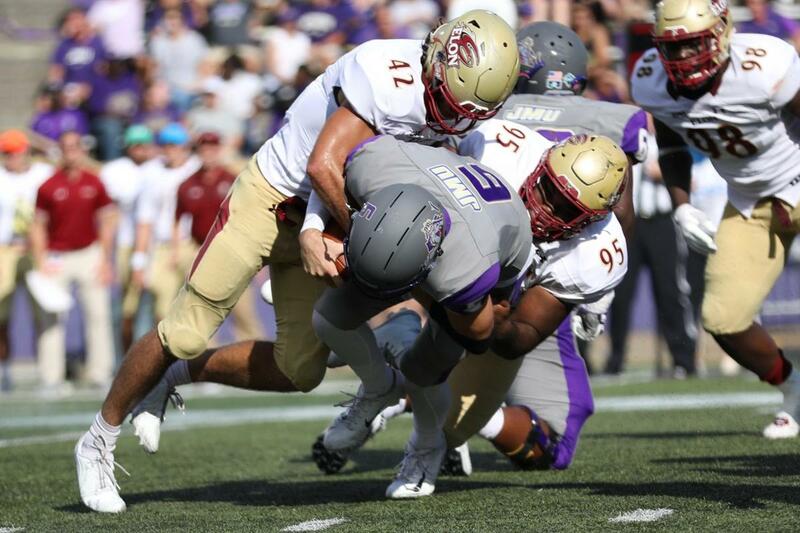 Elon announced itself as a major FCS contender last week by going up to Harrisonburg and beating James Madison. Malcolm Summers ran for 186 yards in ending the Dukes long CAA and home field winning streak. The Phoenix will have to avoid a letdown this week against a good Delaware squad. James Madison never got any rhythm on offense and gave up a number of big plays on defense in a loss to Elon. The loss was the first in the CAA and at home under Mike Houston. The Dukes were uneven all day and never took the momentum as they had done so many times before. This week, the Dukes look for redemption in a tough road matchup at Villanova. If you looked at the stats from Wofford’s game against Chattanooga you would think the Terriers blew out the Mocs. However it was a 4 point game entering the fourth quarter when Joe Newman scored the second of his touchdowns from 66 yards to nail down the win. This week, the Terriers travel to Furman in a rivalry game one week before they take on East Tennessee State for first place in the SoCon. Keelan Doss had a huge game for the Aggies against Northern Colorado, catching 11 passes for 161 yards and a touchdown. Quarterback Jake Maier threw for 382 yards and four touchdowns in the win. This week, UC Davis welcomes the other surprise of the Big Sky, Idaho State. There could be a lot of points scored in this one. Jacksonville State used both Zerrick Cooper and Zion Webb in their easy win over Eastern Kentucky. Is there a QB controversy for the Gamecocks? There is time for them to work it out. 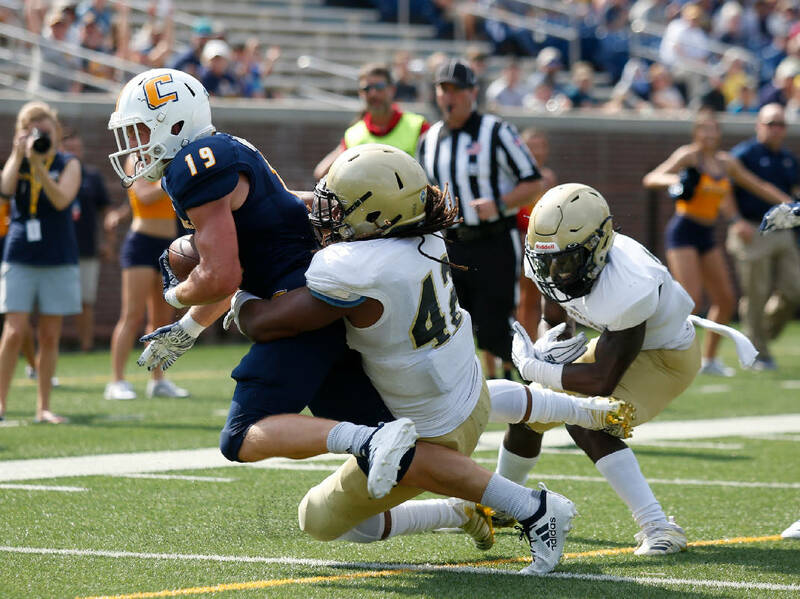 They should easily skate through the balance of their Ohio Valley schedule, including this weekend when Eastern Illinois comes to town, before facing Kennesaw State on the last Saturday of the season. Rhode Island destroyed in state rival Brown 48-0 last week even without JuJuan Lawson. Vito Priore filled in for Lawson and threw for 310 yards and four touchdowns. This week, the Rams take on a Maine team who is also 2-0 in the CAA. 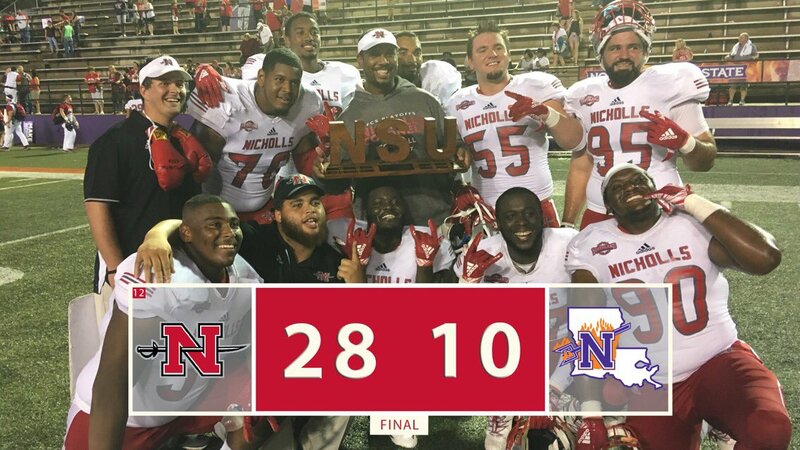 Nicholls State ran its Southland record to 3-1 with a methodical win over Northwestern State. The Colonels scored the last 21 points of the game, including shutting out the Demons in the second half. The Colonels will be looking for their fourth win in a row against Abilene Christian this week in a game they should win. But Nicholls cannot take this lightly as the Wildcats gave McNeese State all they could handle last week. Weber State came up short in their battle against Northern Arizona in an entertaining back and forth game. The Lumberjacks scored early in the fourth quarter, but the Wildcats were only able to respond with a field goal the rest of the way. The Wildcats will have to regroup quickly for Homecoming weekend. The opponent is a red hot Eastern Washington squad. Illinois State trailed entering the fourth quarter of their game against Western Illinois this weekend before rattling off the last 21 points of the game to secure the win. The Redbirds will see another in state challenge when Southern Illinois brings its strong offense to Normal. Towson made easy work of Stony Brook, building an early 21-0 lead and never looking back in a blowout win. Tom Flacco threw for 319 yards and 4 touchdowns and has shown to be one of the best quarterbacks in the CAA early this year. The Tigers have an opportunity to put up another big offensive number this week against a struggling William & Mary team. North Carolina A&T got three touchdown passes from Lamar Reynard as the Aggies easily beat Delaware State last week. The Aggies still have designs on the MEAC title and berth in the Celebration Bowl. This week, they take on the remaining unbeaten MEAC team, Florida A&M. A loss would all but eliminate the Aggies from MEAC title hopes. It was big news when Bucknell hit a field goal in the third quarter against Colgate. It was the first score against the Raiders in three weeks following two straight shutouts. The Raiders still have not allowed a touchdown since their first game of the season, way back on September 1. This week the Raiders take on Cornell looking to get to 6-0 on the season. Stony Brook was never in their game against Towson after the Tigers jumped out to a 21-0 first quarter lead. Joe Carbone again had an uneven performance and the Seawolves were never able to get their running game going. Going by the standings along, it would be easy for Stony Brook to look past this week’s game at New Hampshire, but that would be a mistake. Trevor Knight returned to the Wildcat lineup last week, so the Seawolves defense needs to be ready. Another week, another easy win for Princeton. After finishing the first quarter tied with Lehigh 7-7, the Tigers scored the last 59 points of the game for their fourth win of the season. This week should be another projected win for the Tigers at home against Brown. The Ivy League may not participate in the FCS playoffs, but its clear that Princeton can play with anyone in the country. Kenny Doak hit a 52 yard field goal at the gun to give Maine a win over Villanova. The Black Bears won without the services of quarterback Chris Ferguson, who was again out with a shoulder injury. THe Black Bears travel to Rhode Island this week to play the Rams in a game to see who remains unbeaten in the CAA. Idaho State announced that it is a team to be reckoned with this week in a demolition of in state rival, Idaho. The Bengals got 492 passing yards and EIGHT touchdowns from quarterback Tanner Gueller. This week, the Bengals travel to UC Davis in a game that is sure to have some offensive fireworks. East Tennessee State is off to a strong start to their season, with their only loss at FBS Tennessee. The Buccaneers are the surprise team of the Southern conference as the current leader at 3-0. Last week, the Buccaneers easily outpaced Gardner-Webb. They will be looking to continue their hot start against The Citadel on the road. Sam Houston put up 500 yards of offense in an easy win against SF Austin. THe Bearkats have resembled the offense of the last couple weeks with Ty Brock at quarterback. Brock wont make anyone forget about Jeremiah Briscoe, but he has handled the duties under center very well these last two weeks. This week the Bearkats travel to play an underrated Northwestern State team in a game they have to win to stay in the playoff conversation. Central Arkansas kept their slim playoff hopes alive in the arm of Luke Hales and his 5 touchdowns in the win over Houston Baptist. The Bears won the Southland conference last year but are clearly the number four team (at least) in the conference pecking order this season. They must beat SF Austin this week to remain in the conversation for a playoff spot.